This interrupted case dramatizes the discovery of a Mendelian trait in humans, namely the variation in the ability to taste the chemical phenylthiocarbamide (PTC). 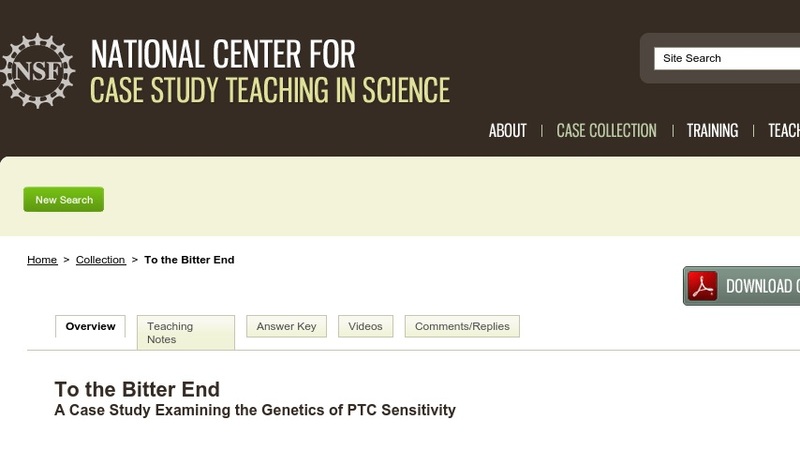 By examining data and questions related to this trait, students will draw connections between Mendel's principles of inheritance and variation at the DNA level by learning about the phenotypic differences due to the single nucleotide polymorphisms (SNPs) in a major gene influencing the ability to taste PTC. Students will review Mendelian inheritance, human pedigrees, genetic markers such as single nucleotide polymorphisms, and gene mutations. If PTC paper is used and student phenotypes collected, this case can be expanded to include a population genetics component on the Hardy-Weinberg Model. The case was developed for a sophomore-level course in genetics.